You might be researching family members and come across one that no one in the family can tell you much about. You know it is your job to tell as much about them that you can find. Sometimes information you can discover from family can link you to historical information online or offline. 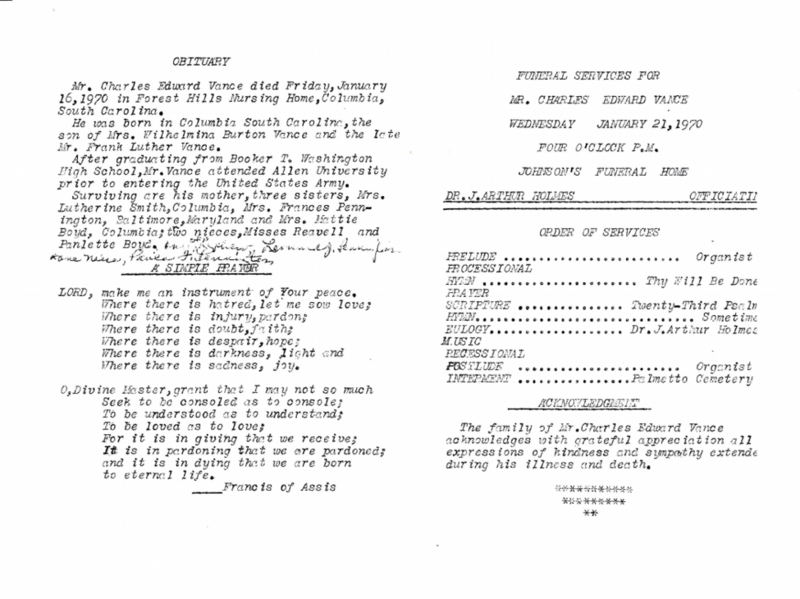 With African American genealogy, funeral programs are very important. 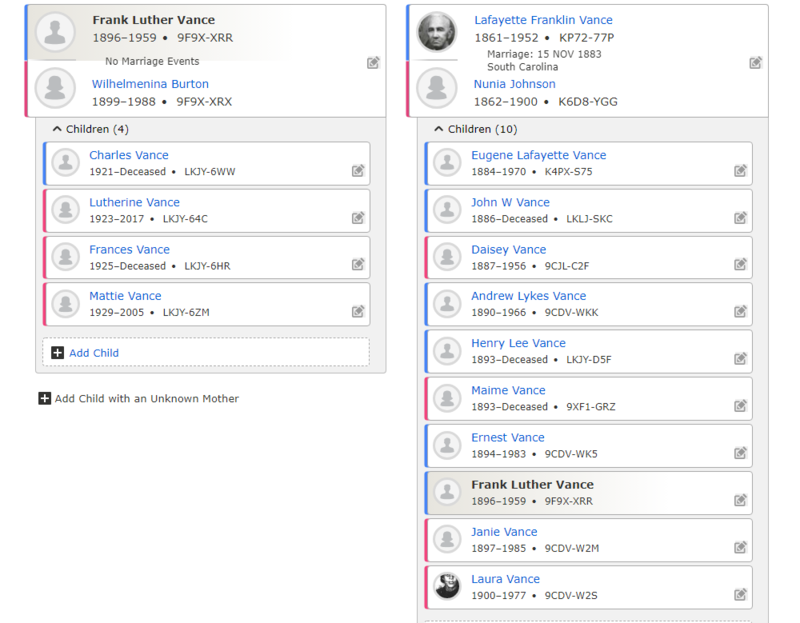 I have been working on Frank Luther and Wilhelmina Burton Vance and their children. I have not entered very much information about Charles Vance. 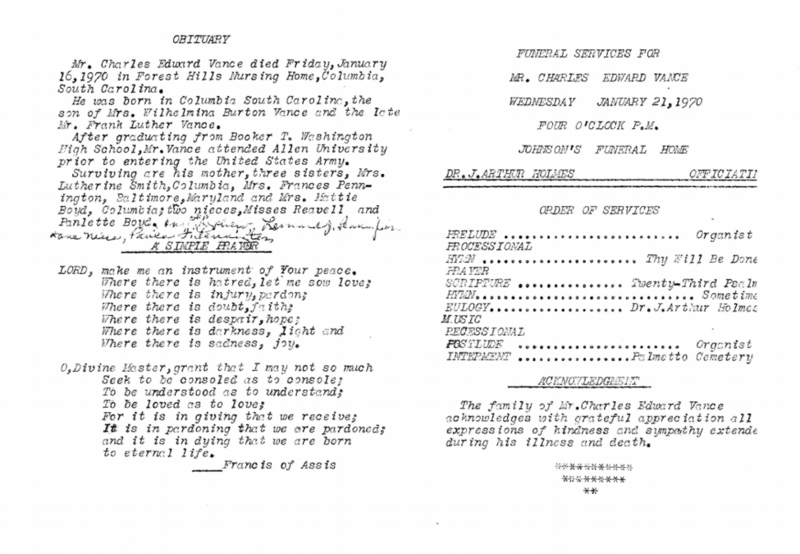 Charles Edward Vance (1922-1970) Funeral Program, Copy held by Robin Foster in 2019 (1441 Ireland Dr. #B, Fayetteville, NC). The funeral program has typos and was hastily put together unlike many of them that were shared with me, and how I wish I had a picture of Charles. This funeral program is all that I received. It says he died in Forest Hills Nursing Home in Columbia, South Carolina on Friday, January 16, 1970. I can add that date once it has been verified. I can also l look for records for Forest Hills Nursing Home. “United States Census, 1930,” database with images, FamilySearch (https://familysearch.org/ark:/61903/3:1:33S7-9RZ2-3Z2?cc=1810731&wc=QZFW-VNQ%3A648803101%2C649825201%2C648891001%2C1589282507 : 8 December 2015), South Carolina > Richland > Columbia > ED 35 > image 9 of 34; citing NARA microfilm publication T626 (Washington D.C.: National Archives and Records Administration, 2002). I was able to find just now the 1940 US Census with this family still together. The name Loula May is a nickname for Wilhelmina I think because she is still with the family until Charles dies. “United States Census, 1940,” database with images, FamilySearch (https://familysearch.org/ark:/61903/3:1:3QS7-89M1-56PQ?cc=2000219&wc=QZFM-4M2%3A791237801%2C793995901%2C796899401%2C952455501 : accessed 21 February 2019), South Carolina > Richland > School District 2A Hyatt Park > 40-47 School District 2A Hyatt Park outside Columbia City E of Southern Railway, Barhamville-Edgewood (part), Booker Washington Heights (part) > image 22 of 52; citing Sixteenth Census of the United States, 1940, NARA digital publication T627. Records of the Bureau of the Census, 1790 – 2007, RG 29. Washington, D.C.: National Archives and Records Administration, 2012. His funeral was held at Johnson Funeral Home. My question is, “Were we related to them?” His maternal grandmother’s side were Johnson’s. My next clue is to find him in Palmetto Cemetery. This was a short funeral program, but it is helping me to learn more about Charles. Have you gone through your funeral programs with a fine tooth comb? Let us know what you found in the Facebook Group.